Shinwa Regal Katana Swords for sale are 40 inches in all. The popular Shinwa Regal Katana Swords have a Damascus blade and real ray skin on the handle. The 28 ½ inch blade is sharpened and has a long blood groove. The handle features real black ray skin that is wrapped in tan cord. The menuki and tsuba are crafted in cast metal. These swords include a wooden scabbard that has a polished black lacquer and is accented with tan cord. 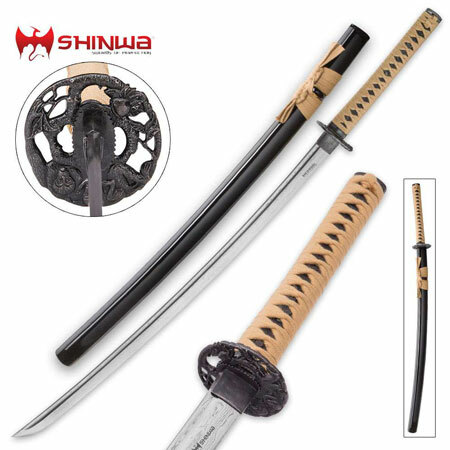 Buy the Shinwa Regal Samurai Katana Swords for $129.99.